Welcome to Standish Boat Yard, Inc.
STANDISH BOAT YARD, INC. WINTER STORAGE RATES!!! NEW WEBSITE!!! www.standishboats.com!!! 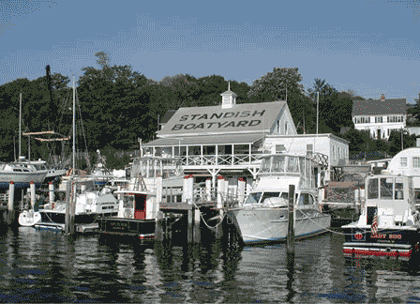 Standish stands out as a quality, full-service boat yard. A classic New England marine establishment dating back nearly six decades ago. Some of the services and facilities include Slips, Moorings, Transients, Gas and Diesel Fuel, Pumpout Facility, Showers, Engine Repair, Hull Repair, Winter Storage, 25,000 lb. capacity crane for hauling and launching. We carry many products in our marine store, including Interlux paints, Petit paints, Sunfish/parts and service, PUFFIN DEALER, Electronics(can be installed), and much more. If you're in the market for a new boat or engine, Standish can assist there. Now New England's Top Selling Dealer for North Coast boats, see our inventory of the very best cruising yachts up to 27' in length. From your slip or mooring, relax and absorb the friendly ambiance of a traditional New England boat yard. Standish provides a front row seat to the passing fleet on the scenic Sakonnet and combines the proven reliability of a family business with a full-service work shop, a stock room packed with parts, and a savvy crew to handle any nautical need. Full-service workshop and marine store, Gas and diesel fuel, pumpouts and repairs. Dockside slips with 15 feet of water. Current Winter Hours are: Mon.-Fri.,9am-4:30PM, Saturdays, 9am-4PM. CLOSED SUNDAYS.Open 7 days/week - 8am to 5PM. Both Power and Sail yacht brokerage. 15+ton Crane. Showers, ATM and nearby Restaurants. Finding Standish is simple. Coming from Long Island Sound follow the Sakonnet River for nine miles, past Gould Island and through a narrow well marked channel. Once into Tiverton Basin, you'll see Standish's moorings, breakwater and huge, rooftop sign off your starboard bow. DEALERS FOR NORTH COAST BOATS.....CURRENTLY IN OUR INVENTORY...A 2018 235 23'HARD TOP MODEL, A 215 21'HARD TOP MODEL, A NEW 2017 260, 24'CENTER CONSOLE, A 2018 190 19'CENTER CONSOLE, A USED 2013 23'CENTER CONSOLE & A 2007 NORTH COAST 20'CENTER CONSOLE RECENTLY LISTED! CHECK OUT THESE USED NORTH COAST MODELS TODAY!!! GREAT DEALS FOR END OF SEASON...AND GEAR UP FOR THE 2019 SEASON!!! STOP BY OR CALL NOW FOR OUR HAPPY HOLIDAY SPECIAL PRICING FOR ALL NEW BOAT ORDERS.....MANY INCENTIVES AVAILABLE.....CALL TODAY FOR DETAILS......HAPPY HOLIDAYS! MAKE SOMEONE'S HOLIDAY WISH LIST COMPLETE!!! ONE STOP EASY HOLIDAY SHOPPING!!!! JINGLE ALL THE WAY!!! NOW AN AUTHORIZED "SIREN MARINE" DEALER! SELLING THE "SIREN PIXIE" & "SIREN SPRITE" MODELS!!! ASK US HOW YOU WILL HAVE THE ULTIMATE "PEACE OF MIND" AND PROTECT YOUR VESSEL, & SAVE ON YOUR MARINE INSURANCE !!! "SIREN MARINE" PEACE OF MIND. SBY GIFT CERTIFICATES ARE THE PERFECT HOLIDAY GIFT!!! OUR CURRENT NORTH COAST HARD TOP INVENTORY INCLUDES: A NORTHCOAST 2019 285 HARD TOP, A NORTHCOAST 2019 235 HARD TOP, A NORTH COAST 2018 215 HARD TOP WITH FULLY LOADED SIMRAD ELECTRONICS...CALL TODAY!!! CURRENT NORTH COAST CENTER CONSOLE MODELS INCLUDE A 2017 260, 24'CENTER CONSOLE, WITH SIMRAD ELECTRONICS PACKAGE...SPECIAL SAVINGS...CALL TODAY!!! 24' NorthCoast Center Console,Trailer & ELECTRONICS....DEMO/SHOW MODEL....CALL TODAY!!! NEW 2017 NORTH COAST 260, CENTER CONSOLE, POWERED WITH TWIN SUZUKI 200 HP ENGINES AND INCLUDES LOAD RITE TRAILER and FULL SIMRAD ELECTRONICS PACKAGE INCLUDED!!! THIS IS A DEMO/SHOW MODEL!!! SAVINGS!!! ONLY NORTH COAST DEALER WITH THE BEST DEAL, ON A 260 CENTER CONSOLE. A 2019 MODEL RETAILS FOR....$150,581.00. BUY OUR 2017 MODEL AT THIS SHOW AND SAVE $24,000.00!!! LET US QUOTE YOU A FAIR MARKET VALUE ON YOUR CURRENTLY OWNED VESSEL....FREE NO OBLIGATION!!! REMEMBER...there's no state sales tax in Rhode Island on New or Used boats.